National Pilgrim Paths Day will see a series of walking and cycling events take place along Ireland’s medieval penitential trails this Easter. Supported by the Heritage Council, this new Easter Festival was launched on Monday by broadcaster Micheál Ó Muircheartaigh at St Patrick’s Cathedral in Dublin. It is hoped that the event will create greater awareness and use of Ireland’s historic pilgrim routes. 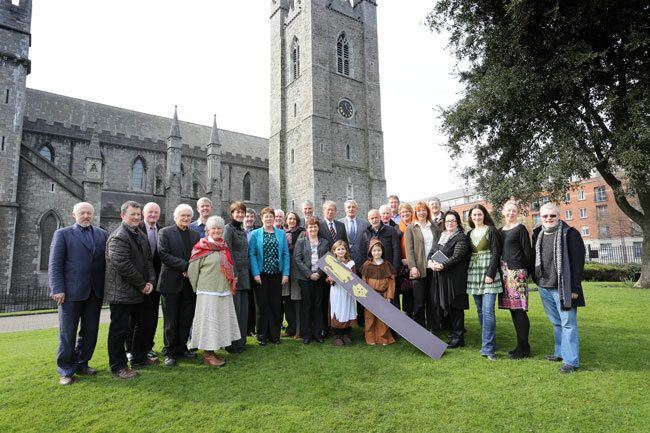 The inaugural Pilgrim Paths Day on Easter Saturday (19 April) is targeted, not only at those who “enjoy exploring Ireland’s ancient tracks, but also the growing number of people seeking to get escape from the daily grind of life and take some time out to reflect and enjoy the outdoors,” according to festival chairman, John O’Dwyer. Events will take place at each of Ireland’s 10 Pilgrim Paths including Glen Colm Cille and Lough Derg Pilgrim Path in Co Donegal’s, Slí Mor in Co Offaly, Tochar Phadraig in Co Mayo, St Kevin’s Way in Co Wicklow, Kilcommon Pilgrim Loop in Co Tipperary, Rath/Dysert Pilgrim Path in Co Clare, Cosán na Naomh Pilgrim Path in Co Kerry, St Finbarr’s Pilgrim Path in Co Cork and St Declan’s Way in Co Waterford. Heritage guides from local communities will lead each event, outlining the story of the route and explaining how medieval penitents coped with their arduous and very often dangerous journeys. The medieval pilgrimage was originally a journey that combined prayer, sacrifice and devotion – with an element of physical discomfort – by which the pilgrim could become closer to God. Over the last number of years, National Pilgrim Paths has worked to develop these routes for the enjoyment of modern walkers and pilgrims alike. According to organisers, pilgrimage has been defined as “a meaningful journey to a place of spiritual significance” and the practice is almost as old as recorded history. In Ireland, the pilgrim journey has strong historic resonance with early Christian scholars coming to Clonmacnoise; medieval penitents journeying to Lough Derg, Holycross and Glendalough, while others sought heightened spirituality by visiting Skellig Michael or climbing Croagh Patrick. Despite this long pilgrim tradition and strong national reputation for spirituality, there is presently relatively little footfall on Ireland’s ancient penitential paths with the country not currently regarded as an important destination for spirituality motivated travel. In this context, Ireland’s first National Pilgrim Paths Day, is aimed at raising awareness of the country’s network of pilgrim routes, providing a more general appreciation of Ireland’s medieval Christian heritage and ultimately generating a revenue stream to help ensure viability for rural communities. The new Easter festival is based on Ireland’s dense network of medieval pilgrim walking routes. This new heritage themed event is organised by the local communities adjacent to each of our principal penitential routes and is aimed at raising awareness of Ireland’s rich inheritance of pilgrim paths. It is targeted, not only at those who enjoy exploring ancient tracks imprinted with the footsteps of our penitents’ past, but also at the growing numbers seeking walkways with deeper spiritual significance. Easter Saturday, 19 April 2014, has been designated Ireland’s first National Pilgrim Paths Day with a nationwide series of walks planned along all of this country’s major medieval, penitential walkways. Pilgrim Paths Day is aimed at providing a warm welcome for participants of all religious backgrounds and equally those without religious affiliations. It is planned as a unifying day emphasising Ireland’s common Christian heritage and is designed to facilitate a deeper understanding of the country’s historic past. Every effort will be made to facilitate the participation of families, the less fit, and in so far as possible, those with special needs in a unique event aimed at rediscovering Ireland’s rich medieval and spiritual inheritance. Most of the pilgrim walks will be single day events taking place on 19 April; some will be over two days, but all will be targeted at returning a degree of deeper reflection on, and appreciation of the Irish outdoors, to the Easter period.